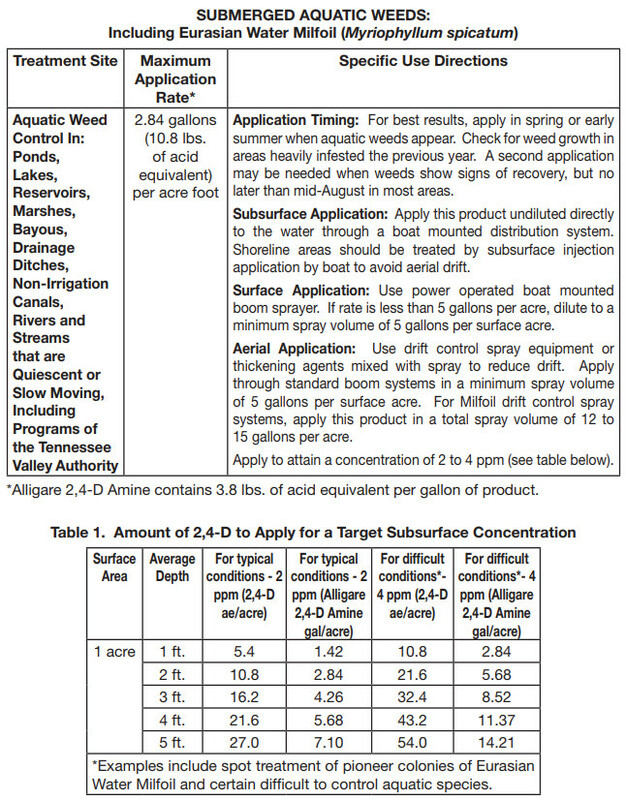 Home » Herbicides/Algaecides » Duckweed & Pondweed Control » ALLIGARE 2,4-D AMINE Herbicide - 2.5 Gallon with Free Shipping! For control of many broadleaf weeds and brush control in corn, soybeans (preplant), small grains, pastures, rangelands, and other listed crops and in non-crop areas such as lawns, ornamental turf, drainage ditchbanks, fencerows and rights-of-way. Also for aquatic weed control, control of trees by injection, and tank mixes. 2,4-Dis perfect for the control of many broadleaf weeds and brush control in corn (field, pop and sweet), sorghum (Milo), soybeans (preplant), small grains (barley, millet, oats, rye, wheat), rice, sugarcane, fallow land, grasses, stone fruits and nut orchards, brush control, pastures, rangelands, forest management and in noncrop areas such as lawns and ornamental turf, drainage ditchbanks, fence rows and rights-of-way. Also for aquatic weed control, control of trees by injection, and tank mixes. EMERGENT AND FLOATING AQUATIC WEEDS: Including Water Hyacinth (Eichomia crassipe) Application Rate: 2 to 4 qts./acre. Surface Application: Do not exceed 8.42 pts./acre (4.0 lbs. of acid equivalent) per surface acre per use season.